"In Saudi Arabia, it is the king and not Allah who commands sovereignty and complete obedience.." In a new audio tape posted on the Web (which is more reliable than Aljazeera as a means of distribution), Osama bin Laden laid out his case against the "kleptocratic and apostate monarchy" in Saudi Arabia. This follows on the heels of the attack on the US consulate in Jeddah. Both attacks are part of the psychological "shaping" of the Saudi Arabian battlespace and al Qaeda's new role as the provider strategic guidance for the insurgency (Zarqawi's organization, recently "officially" acquired by al Qaeda, provides operational goals in Iraq). This leadership isn't directive in nature, but rather by one of example and influence. UPDATE: Osama also urged global guerrilla operations against strategic oil networks: "Take jihad [holy war] to stop [the Americans] getting hold of [the oil]. Concentrate your operations on the oil, in particular in Iraq and the Gulf." Chechen guerrillas attacked a natural gas pipeline in southern Russian (Dagestan) on Wednesday. 21 people were injured in the secondary explosions. The pipeline has been attacked three times since 1996 by Chechen insurgents. This incident demands close scrutiny due to the extreme vulnerability of the Russian oil and gas pipeline system (Transneft). An aggressive, continuous global guerrilla assault on Transneft's assets would bring Russia to its knees financially and would place control of the price of energy in the hands of anti-state forces (see A Shadow OPEC for more). Russia is not only the second largest oil producer in the world, it also contains the world's largest proven reserves of natural gas. The heavily fortified US consulate in Jeddah, Saudi Arabia was attacked on December 6th, 2004. Four Saudi Security guards and five non-US staff members were killed and several US staff members were injured. Three of the attackers were killed and two captured. In response, the US embassy and consulates were closed for the day throughout the Kingdom. The US has already sent home non-essential staff and has urged tens of thousands of American corporate employees to leave the country. As anticipated by this author, the global guerrilla campaign in Saudi Arabia is in motion. The insurgent "chatter" in the country has been at a minimum since this summer, which presaged new violence this winter (and not that the Saudi counter-terrorist operations were successful). The attack on the US consulate is part of a psychological "shaping" operation by global guerrilla groups in the country. It is important for the guerrillas to frame this conflict in terms of a war against the US and the Saudi Royal family (the "apostate kleptocrats") prior to full-scale systems disruption (think in terms of methods that route around the highly optimized tolerance of current Saudi systems). The Basque seperatist group, the ETA, blew up five gas stations in Madrid on Friday the 3rd of December, 2004. In line with previous attacks, the group warned the government to evacuate the sites prior to the explosions (which is smart). The attacks snarled traffic in Madrid for hours as people attempted to depart the city for the weekend. Earlier this year, the ETA blew up several critical transmission lines that carried power exports from France to Spain. This type of attack is clearly in line with global guerrilla strategy (system disruption) and portended a dire future for that conflict if it followed Iraq's cue. With this most recent attack, the ETA demonstrated that they don't fully understand (a good thing) how to disrupt systems. Their attacks were too far down the retail chain to cause either market or infrastructure disruption. Additionally, the leverage (economic damage vs. assault costs) gained was likely only 50 to 100 x (much less than 10,000 x to 100,000 x leverage we see in Iraq). 11 improvised explosive device (IED) "factories." 203 weapons caches (graphic of the amounts of large munitions found). 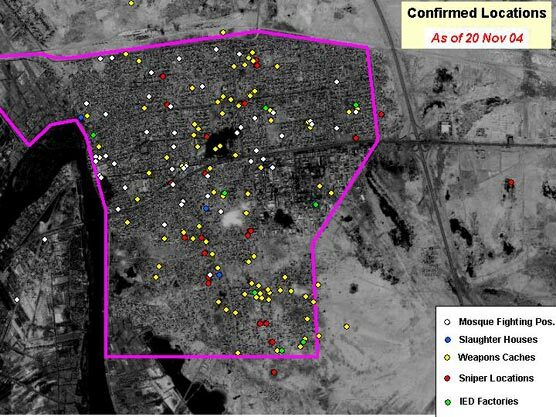 The data (and the map) indicates a very dispersed operation in Fallujah. One explanation for this is that US airstrikes on guerrilla facilities in the city forced decentralization. However, a more likely explanation given the available data on how the city was run indicates that the insurgency in Fallujah TAZ was a highly decentralized organization at the outset -- the dispersion of the facilities merely reflects this organizational style. For example: each group likely had their own caches of weapons and/or a factory. One final note on the centrality (or more precisely, the lack of centrality) of Fallujah. The data shows that very few IEDs and IED materials were found (less than a month at the current run rate). Obviously, many of the devices were removed prior to the assault for use in the multi-city counter-assaults that occurred. However, even if we assume that each IED "factory start-up" produced a device every day (a generous assumption), the total production rate would be less than 1/4 of the current usage rate of 772 IEDs a month (half of the production ended up in inventory or were rejects/duds).